Tactile and visual toys that must be felt to be experienced. 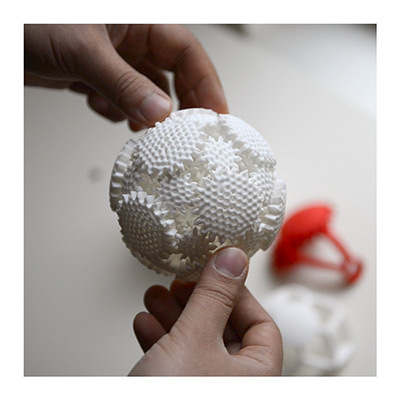 Mechaneu v1 3D-printed sculpture with manual interaction. Mechaneu v1 is the first in a series of kinetic objects designed to explore the limits of 3D printing. Created in a one-shot fabrication process, Mechaneu v1 features an elaborate network of interlocking gears and supports. Spin one gear and the entire sphere is catalyzed with rotation. The effect is mesmerizing, a visualization for the eye and a tactile experience for the hands. The Mechaneu v1 was created with sophisticated 3D modeling tools and custom algorithms. 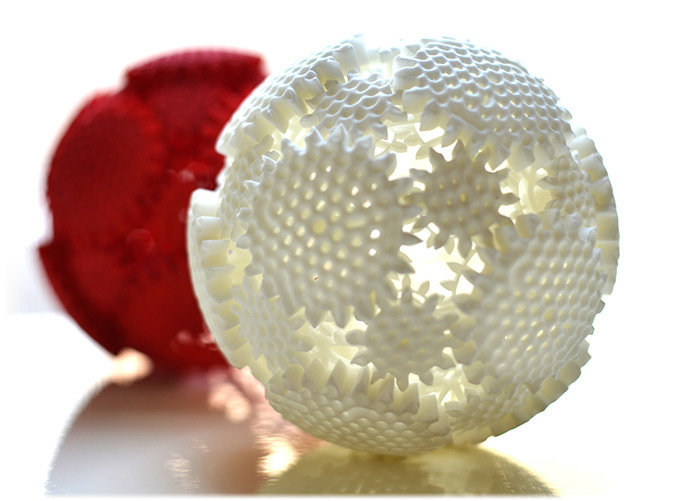 The texture and tactility of Mechaneu v1 are a result of an algorithm that models cellular growth patterns, giving the object its porosity and pattern. The structural thicknesses, extrusions, gear ratios and other elements of the Mechaneu were calibrated for both strength and quality of interaction through a process of physical and digital prototyping. Though each gear is extremely thin and porous, they feel solid to the touch and invite interaction. The structure pushes the limits of most commercial print services. Mechaneu v1 is a limited production art object that will simultaneously push forward and exemplify the current epoch of 3D printing. Spherical gears have long been a topic of mathematical and practical discovery and insight. Kenneth Snelson proposed a spherical set of gears as an intuitive model for learning about atoms and the configuration of electron orbits. His "atom" project resulted in this patent from 1966 (now expired). His wonderful animations show different gear configurations in action. 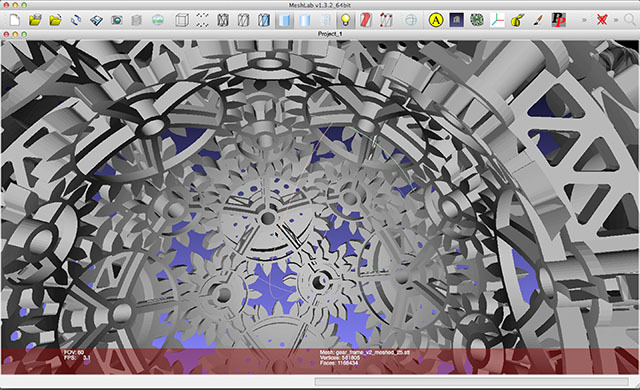 In 2011, mathematician Paul Nylander created a software to find all potential configurations of spherical gear assemblies. The Mechaneu’s configuration of gears is a truncated icosahedron, which was included in this exhaustive set. The truncated icosahedron, sometimes referred to as Fullerene, was also explored by Eric Cox in his 2012 blog post on spherical gear configurations. The Mechaneu v1 is designed by Proxy Design Studio, an architecture and design studio based in NYC. 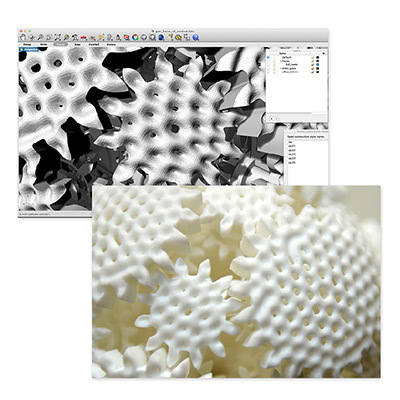 The studio has focused on computer-controlled fabrication and advanced algorithmic form-finding since its founding partners began collaborating in 2005. The Mechaneu v1 is a result of years of research linking bio-memetic design strategies with algorithmic tools. Working between custom software and advanced 3D modeling techniques, the studio creates environments and products that exceed the potential of traditional designer/fabricator roles. "In nature shape is cheap and energy is expensive. Nature solves many problems through shape alone, using material only where needed and taking out where unnecessary. This is a strategy you find over and over in the natural world, leading to complex geometries such as bone structures. We used this same logic on every part of the Mechaneu to create a porous object that feels completely solid." "Something happens between the hand and the brain when you pick up the object and start to engage the gears. It taps into a fundamental desire to see our actions multiplied and intensified. For me its somewhere between a tool and a toy. I pick it up when I’m thinking, talking on the phone or even frustrated. Like doodling on scratch paper, it takes away just enough of your brain that you open the door to calm, insight and reflection. We knew we were on to something when we couldn’t put the prototypes down." The most geometry you can print commercially. All aspects are calibrated to minimum thicknesses and maximum detail. Designed by applying both mathematical and architectural principles. As much detail as would go into a building, in your hands. A tactile experience for your hands that you have to feel for yourself. A zen garden in an addictive sphere, you'll keep reaching for it.